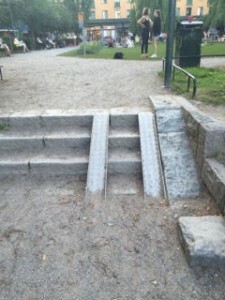 • Universal Design is prevalent, so much so, that no one really notices. The bathroom problem is solved without need for Supreme Court intervention, ramp/stair access, and public transportation is everywhere. There is no ADA as all rights apply to all citizens. 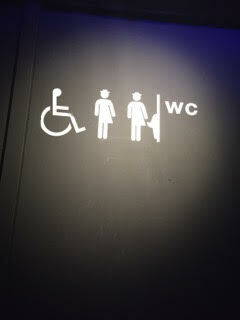 Universal design is prevalent for anything that uses wheels. The bathroom issue has also been solved! Everyone uses the same one. The downside of the observations and conversations is that much of the decline in education in Scandinavia is mirrored in the U.S. as privatization and market-driven approaches are pulling from the neighborhood school and equity in many countries. 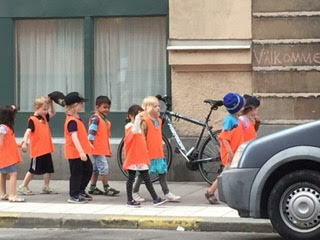 Sweden has ‘friskola’ or charter schools which began in 1992 that use tax dollars, but are privately run. The schools comply with the standard Swedish curriculum and can have a religious affiliation such as with Scientology, Plymouth Brethren, Muslim, and Christian religions. There is current debate about some schools separating boys and girls and if there should be a law that students should learn together. Friskolas/charters account for about 9% of elementary schools and 17% of secondary schools. Sweden has joined the market-driven education system, but not without debate and awareness of all of its citizens. I was also able to interview Ingemar Emanuelsson and gather his interpretations of the current status of equity, mostly from an education perspective. I highly recommend the book Education and Equity in Cold Climes in which he has a chapter. Academics from both England and Scandinavia contributed to the publication. Standardized testing has increased as the strong push for accountability takes place in England, Scandinavia and the U.S. There are many aspects of a neighborhood community/state/country that create inclusive lives for people with disabilities – the layers are thick and varied and fascinating to watch in the implementation process. Considerations in this inclusiveness can include things such as economic differentials, laws, funding mechanisms, direct care staff status/salaries, values of the community, politics, architecture and attitudes that are developed informally from an early age via experience. When all the characteristics are put into play, you can get an amazing outcome, or the reverse, situations that promote abuse, economic strife, and discrimination. In Sweden, because of the lack of economic strife and having education, health care, and the clean environment met by taxes, there is still a middle class and therefore, a lack of obvious differences that causes exclusion. For a negative example, when an exclusive private school includes a couple of students with scholarships, the discrepancy is too large to bridge the differences and often the ‘inclusion’ is worse than had there been no effort. Bullying transpires. If there is little differential to begin with, inclusion comes naturally as the environment is so conducive to it. Regarding housing, say Warren Buffet contributes large amounts of money and gets his tax deduction for developing 50 affordable housing units. They are segregated by both geography and funding mechanism. If there were a larger middle class and fewer of the 1% class, there would be no need for the ‘charity’ or for the special housing. There would be affordable housing for all. So, the conclusion is simple. Life is not fair and it is a good thing to be born Swedish or to move there. There are numerous policy initiatives we could adapt in the U.S., but only if we have the goal of equity and excellence in our human service system and elsewhere. 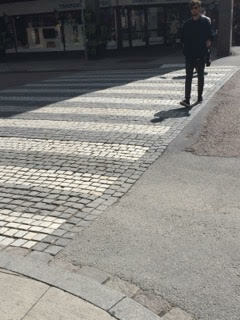 Relevant to nothing, the streets literally have white marble cobblestone crosswalks!